Exercises for seniors will aid in maintaining a good posture. Posture is especially important in older people as muscles on the front of the chest and hips often become tight and pull us forward. That is why some develop a rounded back posture and tend to walk bent forward. It is necessary in order to maintain a good posture and functioning range of motion to find the balance that should exist between extensors and flexors all over the body. A we age connective tissues become less elastic, so while those under 35 can manage with stretching two or three times a week, those older would benefit more from stretching daily. What are Some Exercises for Seniors? What are the Benefits to Seniors? How Does Aging Affect Fascia? exercises for seniors should also include a comprehensive stretching program to maintain joint and muscle flexibility. Since this is a website to specifically cover stretching, that is what we will focus on here. I will provide links to other relevant sites at the bottom of this page. What are the Benefits of exercises for Seniors? relieve the pain from arthritis. Even if you've never undertaken an exercise program, it is not too late to start reaping the benefits. By remaining active, exercises for seniors will help you continue to do all the things you like to do and remain independent as you get older. Exercises for seniors don't have to be undertaken in a rigid class format. Activities you love such as gardening, going for a brisk walk, or raking leaves are all forms of exercise. The benefits you get from activity is cumulative, so just several brief bouts of exercises through the day can be as good as one long exercise session. Either way it's important to fit it into your lifestyle in an enjoyable way in order to stick with it. Connective tissues like fascia change as we get older. Collagen content in the fascia increases as does cross bridging between the collagen molecules. Elastin content decreases and becomes fragmented. A tendency to become dehydrated also reduces elasticity in fascia. However, research shows that the more you stretch, the more your body produces the substances needed to maintain flexibility. Reductions in joint mobility normally come with age and research has shown that with this loss of flexibility comes poorer scoring in measures of performance in activities of daily living. Likewise studies have shown that when groups of individuals improve their flexibility, their quality of life scores also improve. Research shows that there are declines in joint range of motion with age from 70 to 92 years of age, with increasing decline into the 90's. (5,6) Maintaining this mobility is important to maintaining function. Start slowly. Chances are it's taken years for you to get this stiff. It's not going to be fixed in a day. Drink plenty of fluids unless your doctor has advised you against this. Don't hold your breath during stretching. Relaxed breathing actually helps your muscles relax. Always be aware of the position of your spine. Any extremes in curvature can make you vulnerable to injury. Warm your muscles briefly prior to stretching by taking a short walk or using some light dumbbells. A study published in the Alternative Therapies in Health and Medicine in 2006 looked at the effects of yoga on 135 healthy individuals between the age of 65 and 85(8). Results showed significant improvement in quality of life measures and physical measures. Physical measures were forward bend flexibility, a timed single leg stand to assess balance, and a chair sit and reach test for flexibility. flexibility of the hamstring muscles. Phys Ther. 1994;74:845– 850.
underlying mechanisms. Med Sci Sports Exerc. 1994;26:432– 439. 4. Feland JB, Myrer JW, Schelthies SS, Fellingham GW, Measom GW. The effect of duration of stretching of the hamstring muscle group for increasing range of motion in people aged 65 years or older. Phys Ther 2001;81:1110-1117.
in elderly men and women. Am J Phys Med Rehabil. 1989;68:162–167. 8. BS Oken, MD, D Zajdel, S Kishiyama, MA, K Flegal, BS, C Dehen, M Haas, DC, MA, D F. Kraemer, PhD, J Lawrence, BS, and J Leyva, BS, MHA RANDOMIZED, CONTROLLED, SIX-MONTH TRIAL OF YOGA IN HEALTHY SENIORS: EFFECTS ON COGNITION AND QUALITY OF LIFE Altern Ther Health Med. 2006; 12(1): 40–47. The following exercises for seniors are such that those in the general population may benefit. If you have a particular condition, or muscle imbalance, contractures, or spasticity, you need to consult with your physical therapist for a program that is appropriate for your needs. Throw a towel over your left shoulder and grab a hold of the end of it with your right hand. Use your left hand to pull your right hand up your spine. Keep your right arm relaxed as you pull with your left. Pull only to the point of resistance and hold this position for 30 to 60 seconds. This stretch stretches the muscles on the front of your chest and shoulders. Only lift your arms into the doorway as far as you comfortably can. If you have shoulder pain, consult your physical therapist prior to performing this stretch. Keep your chest up and take a small step into the doorway. Only move into the point of resistance. With prolonged sitting at computers we become accustomed to the forward head posture. This posture leads to tightness in the short neck extensors and can further narrow disc spaces in the neck leading to aggravation of arthritis and pinched nerves. This stretch works to stretch these tight extensors and open up the spaces where the nerves come out of your neck. You must be sure to keep your chin tucked in prior to pulling your head forward to minimized shearing forces on the vertebrae in your neck. Shearing forces can further aggravate arthritis and pinch nerves. If you have a neck condition, definitely consult your physical therapist prior to doing this exercise. Stand or sit tall with your chest up. Put one hand on your chin and translate your head back over your shoulders (don't look down or up, you should be looking straight ahead) so you have a double chin. Hold your chin back as your reach over your head and gently pull the top of your head forward. This is not a large movement, but is very effective. Remember to be gentle as there are a lot of little joints in your neck and muscles at the base of your skull that may be sensitive. Hold this for 30 to 60 seconds. The hip flexors will quickly become tight if you spend a lot of time sitting. Tight hip flexors can often be an indirect cause of back pain when walking. In order to perform this stretch you may need to put a cushion or two on the floor for your knee if you have knee stiffness. Get down onto the right knee and put your left foot in front of you flat on the floor. It may help to do this next to a chair or bed to hold onto. Put your right hand on your right hip, keep your chest up and push your right hip forward. Don't lean forward - keep your chest up. At the fully stretched position your right knee should be behind you. Hold this position for 30 to 60 seconds. Don't bounce. More benefit is achieved if you don't bounce. If you have arthritic knees, a knee replacement or a hip replacement, definitely consult your physical therapist prior to attempting this maneuver. The easiest way of stretching the hamstrings without straining your back is to perform the standing hamstring stretch. Find a stool or chair and put your right foot up on the chair. Straighten your right knee, keep your chest up and your back straight as you slowly lean forward toward your right foot. You can gently hold your right knee straight as you do so to prevent it from bending up. Definitely don't bounce into this as bouncing can cause muscle or back injury. You gain more by holding a sustained stretch. 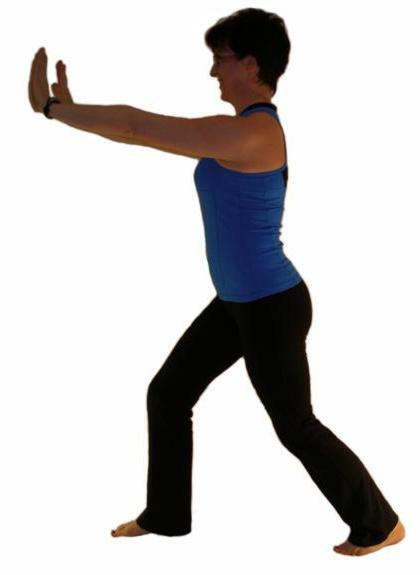 Stand back from a wall and place both hands on the wall so that your arms are straight. Place your right foot behind you while keeping your toes pointing forward. Keep your right heel on the ground and your right knee straight. Slowly lean forward until you feel a stretch in the back of your leg. Hold this for 30 to 60 seconds. Don't bounce, as a sustained stretch is more effective and bouncing can lead to injury. From this position bend the right knee, and while keeping your heel on the ground, hold this position for an additional 30 to 60 seconds to stretch both parts of the calf musculature. You don't have to be over 65 to have a lack of motivation for exercising. A belief of "no pain, no gain"
A thought that "damage is done, it's too late to start now"
Start by getting clearance from your family doctor, get active gradually, and seek the advice of a professional if you're not sure of mechanics of an exercise, how you should progress, or which exercises are best for you.